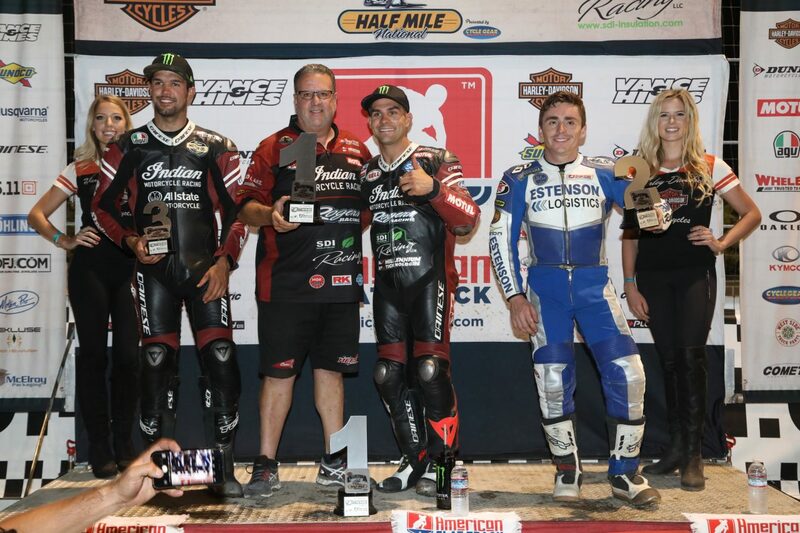 CALISTOGA, CA (JULY 31, 2017) – Indian Motorcycle Racing and the Scout FTR750 has secured its tenth first-place finish of the 2017 American Flat Track season with Jared Mees’ dominant performance at the Calistoga Half-Mile. Jared Mees captured his sixth win of the season and was joined on the podium by fellow Wrecking Crew rider Brad Baker, who placed third. Together, these finishes propel Indian Motorcycle Racing to 25 of 33 podiums during the season so far. Jared Mees remained red hot and proved to be unstoppable around the Calistoga Speedway on his Scout FTR750 during the main event. Mees finished the 25-lap race with a significant 3.571-second margin of victory and sailed by the chequered flag in a one-handed wheelie. The closest battle was for third place between teammates Brad Baker and Bryan Smith, with the former edging out by 0.067 of a second for the podium finish. Through 11 races this season Jared Mees and Bryan Smith own ten first-place finishes. The Wrecking Crew also holds the top three positions in the season’s point standings with Jared Mees at 227, Smith at 209 and Baker 166.